What are these Sedona vortexes? Vortex sites are enhanced energy locations that facilitate prayer, meditation, mind/body healing, and exploring your relationship with your Soul and the Divine. Vortexes are neither electric nor magnetic—although these words are often used to describe the vortexes, along with other terms such as masculine or feminine sites. The explanation for vortexes lies more at the boundaries of known science, rather than in electromagnetic descriptions or gender-related labels. Recently the PBS program Nova, featured a breakthrough in physics called “String Theory” (also known as super-strings) that is revolutionizing all of science on the same order of magnitude that Einstein’s discoveries did in the early 1900’s. The key spiritual implications of super-strings is that the world’s top scientists agree that all things exist in a minimum of 10 or more dimensions. Simply stated Vortex sites are locations having energy flows in those deeper dimensions that the Soul can explore and expand into. Upflow Vortexes (also called electric or masculine sites) have energy flows that help you soar to higher spiritual perspectives. They enhance prayers or meditations for blending with the Universe, feeling one with the Divine, or facing a problem from a Soul level. Inflow Vortexes (also called magnetic or feminine) have energy flows that help you go inward. In them you will be more successful with meditations or prayers about your life purposes or how to heal hurts in your past. There are also Combination Vortexes that have aspects of both energies. These allow the seeker to experience more advanced or in depth spiritual skills and meditations. 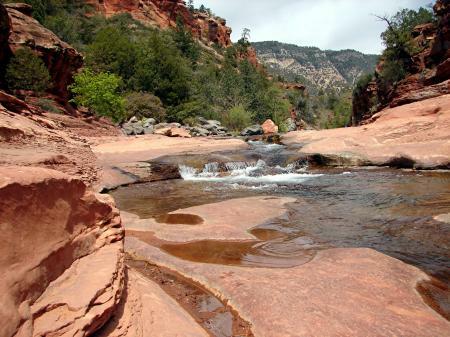 Give yourself the gift of tapping Sedona’s potential for spiritual renewal and advancement.